I was never a sporty kid, on the field or off. My playtime in the 1970s and 80s was much more apt to be spent gluing-up Airfix models, battling with Kenner Star Wars action figures or campaigning through the latest Dungeons & Dragons adventure. One of the few memories I have of a game I loved as a kid that didn’t involve dank passages, spellcraft and random encounters with wandering bugbears was Mattel’s Talking Football game. 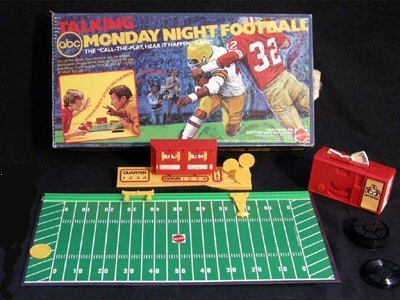 First released in 1971 and then re-reissued in 1977 as Talking ABC Monday Night Football, this semi-obscure classic was the alternative to the electric football games a lot of my friends had in the 1970s. The electric football games looked great with their customizable football player miniatures vibrating all over the little field in random directions but those never really added up to much of a game for me. Talking Football was in a league of its own. Talking Football had a pretty conventional football field playing board with sliding plastic clips to show yardage progress and first down markers. Other plastic components included a little scoreboard and a place to mark downs and quarters. The nifty mechanic of the game was in the tiny plastic records that made the game “talk.” Play began with the offensive player selecting from one of the ten “standard” play or three “special” play records. The chosen record was inserted into a little handheld player and then the defensive player rotated the record to a defensive play. Once plays were selected, a lever was pressed and simulated audio recordings of announcers calling the play would play in combination of the offensive and defensive selections. The result of the play would be recorded on the field and the next play would be set. To a kid living in the pre-videogame era of the late 1970s, Talking Football was a blast and a bit of a technological wonder. Over time, players got used to the hundred or so combinations of plays and the game would repeat itself a bit at times. This became part of the strategy, as the game was basically one of picking the right play you thought would best defeat what you predicted your opponent would pick. To answer the repetitive standard set of 13 records, Mattel also offered expansion packs for the game with celebrity player voices on picture disc records, including Merlin Olsen and O.J. Simpson. I didn’t own a copy of Talking Football, but one of my good friends did. Flash forward more than three decades, and that friend is an on-air radio personality at a rock station in Northern New York State. I don’t know if the hours we spent playing Talking Football and hearing those recorded announcers call plays had any effect on my friend’s future career choice. That said, I think of how games shaped me into the person I am today and like to think that maybe those scratchy, plastic voices still reverberate with my old friend today. Collector’s Note: Mattel’s Talking Football can be found for sale from special sports memorabilia companies and on eBay. The standard game can run anywhere from $40-200, depending on condition. Buyers should beware that many collectors indicate the original players haven’t always aged very well due to their cheap, dated technology. The individual player records go for around $10 apiece.